“those who fail to wind down such activities with Iran by the end of the period will risk severe consequences” (US, White House 2018). “Europe, Russia, China, international traders should stand up and challenge the American decision in the United Nations and in the WTO. We have to stand up against it. It’s a question of principle. After World War II, we created a very positive empire of norms, and we should defend these norms and standards” (Tehran Times, 30 May 2018). He also said that though it was “likely to result in a loss of economic benefits to Iran, the Europeans, Russia and China are likely to look for as many ways as possible of compensating for that economic loss” (Tehran Times, 28 May 2018). In a statement, Federica Mogherini, the EU’s foreign policy chief, said that the 28-nation bloc would be united in preserving the international nuclear deal. She said that member states were closely coordinating their efforts “to protect the economic investments of European businesses that have legitimately invested and engaged in Iran” during the past three years since the nuclear deal was agreed (The National, 28 May 2018). Yet, she considered the nuclear deal, in which Iran agreed to discontinue any nuclear weapons development in return for the easing of sanctions, “an important pillar we don’t want to do without” (Deutsche Welle [DW] 9 May 2018). French President Macron said that he regretted the United State’s decision to withdraw from the nuclear deal. Yet, he said, he would work towards a broader agreement that also encompassed Iran’s ballistics programme and regional activities. Macron admitted that “the nuclear non-proliferation regime is at stake” after speaking with Trump (France 24, 8 May 2018). Russia’s Permanent Representative to the European Union Vladimir Chizhov said that the nuclear deal would stay in place, regardless of Trump’s position, but there would be problems with its implementation. He said that whatever the White House might say, it would mean that there could be problems on a path of its implementation. But it in no way means it would be broken down. “It is a multilateral document approved unanimously, including by the United States, at the United Nations Security Council in the corresponding resolution.” “So, I am convinced that the rest five nations (Russia, China, the United Kingdom, France and Germany – TASS) will stay committed to this deal, and I hope Iran will stay committed to it too,” he said (TASS, 8 May 2018). “It might even be easier for us on the economic front, because we won’t have any limits on economic cooperation with Iran. We would develop bilateral relations in all areas – energy, transport, high tech, medicine,” he said. “If the United States breaks an international agreement backed by UN Security Council resolutions, it will be the United States that should suffer the consequences. Neither Iran nor China nor Russia nor the European states should lose out,” Yermakov said (Ibid). 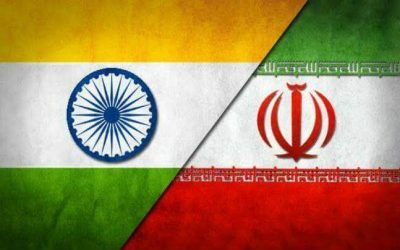 “India has always maintained that the Iranian nuclear issue should be resolved peacefully through dialogue and diplomacy by respecting Iran’s right to peaceful uses of nuclear energy as also the international community’s strong interest in the exclusively peaceful nature of Iran’s nuclear program. All parties should engage constructively to address and resolve issues that have arisen with respect to the JCPOA” (India, MEA 2018a). 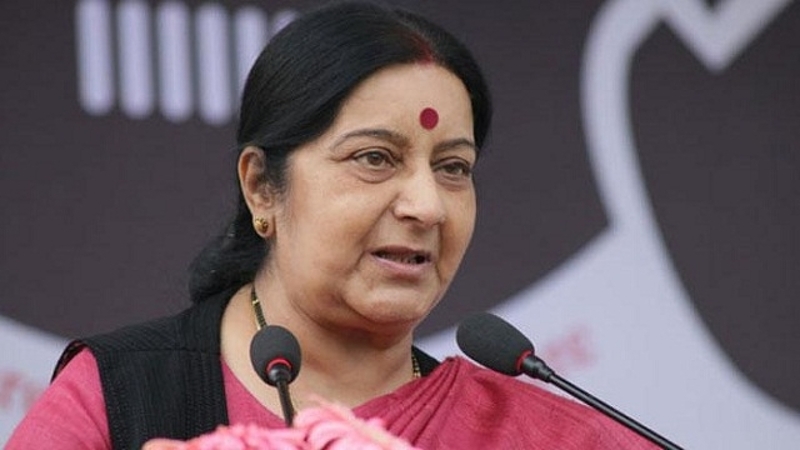 Later, India’s External Affairs Minister Sushma Swaraj (image on the right) stated that India, a long-time importer of oil from Iran, only complies with United Nations-mandated sanctions and “not any country-specific sanctions.” The press release of the MEA, after meeting of the Iranian foreign minister Javad Zarif with the Indian counterpart Sushma Swaraj noted that “all parties to the agreement should engage constructively for peaceful resolution of the issues” (India, MEA 2018b).